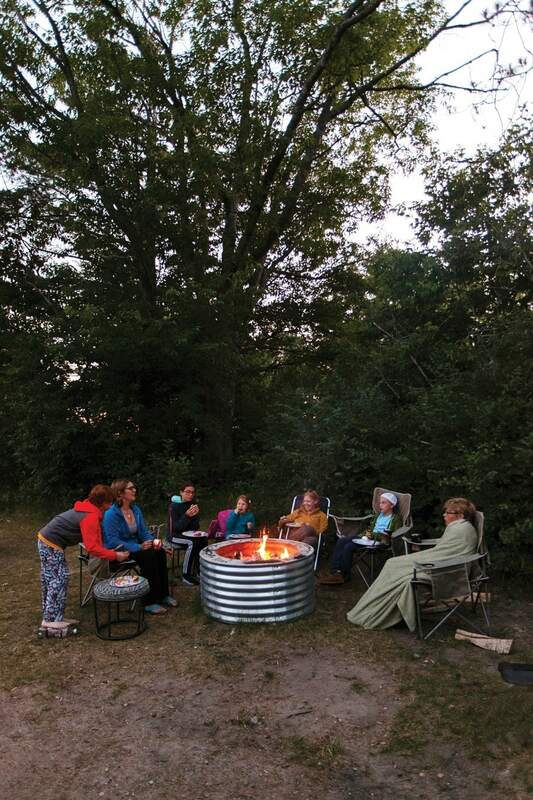 Two moms, five kids, an annual camping rite. It’s real. It’s chaotic. Well, kind of a cluster, actually. And it’s fabulous. 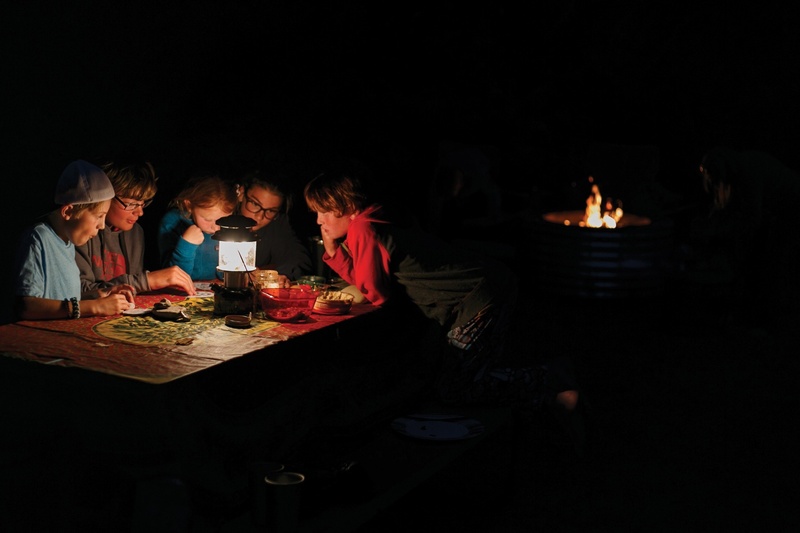 Some magazines make camping with kids look like an art. A Pinterest board come to life. 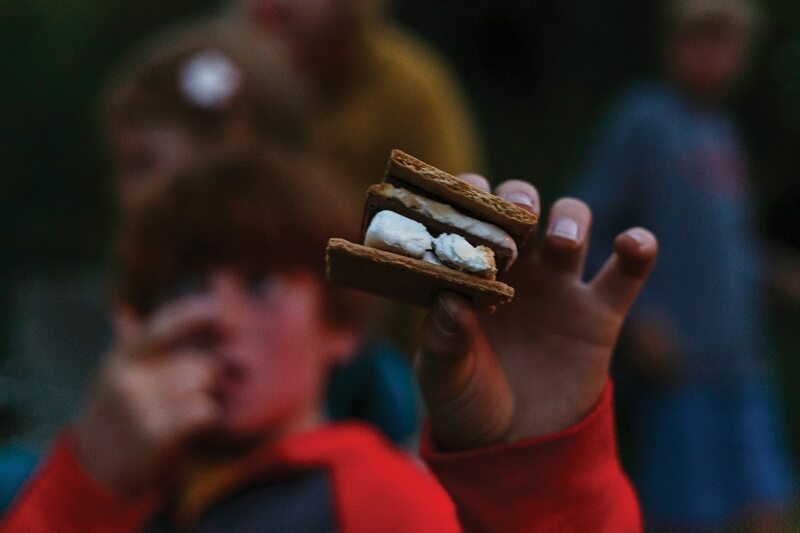 Glossy pages filled with gourmet s’mores recipes, detailed crafting plans, smiling moms who outline perfect lessons for compass use or tree identification or how to skip smooth stones across glassy lakes. Step by step directions to one-up Martha Stewart at a local campground. Because we are not those moms. But, full disclosure, we have sort of tried to be those moms. 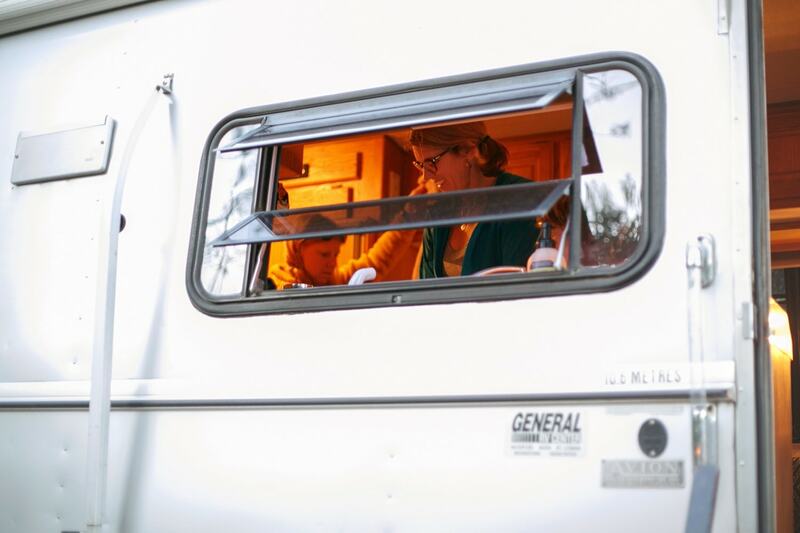 We are Molly Ames Baker and Kate Bassett, two friends who, years ago, set up side-by-side tents with toddlers and babies in tow for an overnight escape at our local state park. Moms who stayed up well past midnight dreaming of future adventures involving phrases like “hiking in” and “digging cat-holes.” That was the start of a mom-and-kids-only camping tradition; and looking into the future, Molly and I were sure that each outing ahead would get more rugged and experiential and educational. I even went home and bought some how-to guides. Such lofty goals seemed logical. After all, Molly ran an outdoor education program at Colgate University for more than a decade and has dedicated her life’s work to place-based education. On my end, a convincing and vivid imagination swears I still love sleeping on uneven ground and don’t mind carrying tired kids/extra packs/the weight of how-much-farther on my shoulders. Fast forward five or six years. 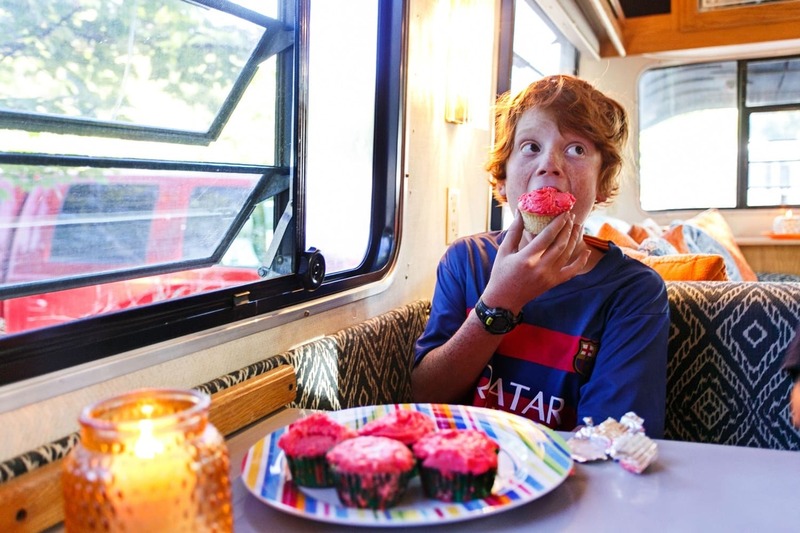 We discover we’re actually moms who do a lot of laughing at earlier ideals while clinking sweating copper mugs filled with Moscow Mules, in drive-to campsites with tents up only for show—because we like the camper. Which is why, T-minus 10 minutes before we’re supposed to be kicking off this summer’s Baker-Bassett Moms and Kids Camping Extravaganza, I’m still scrambling, tossing half-folded beach chairs into the car on top of overnight bags, pillows, two headlamps (currently without batteries), one hammock, a stray flip-flop, baseball glove, three books, chips, marshmallows, hot dogs, an almost empty bottle of Mike’s Mustard, plus the forgot-to-pack fleece sweatshirts, one pair of black sweatpants and two sets of swim goggles that will never get used. 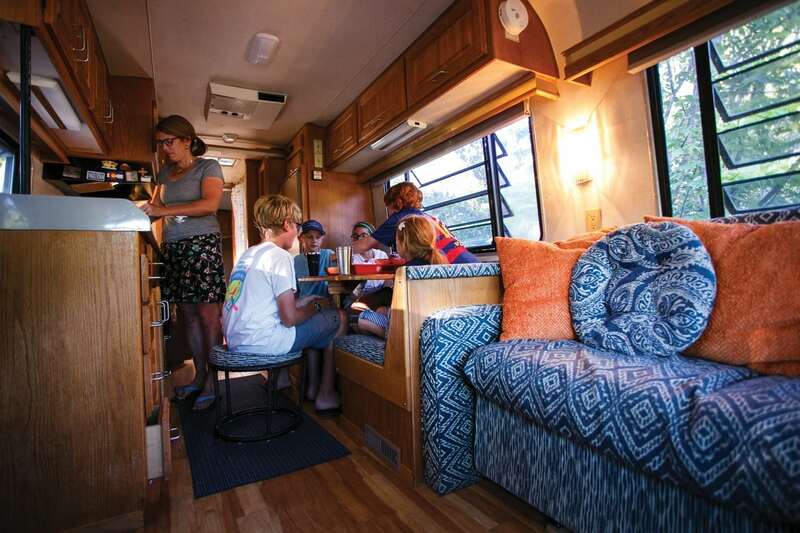 We crane our necks and examine the explosion of “camping” equipment in the backseat before repacking to create just enough room for an 8-year-old in back and an 11-year-old up front. Molly and I love Lake Michigan and traditions with shared fervor. Today’s trip checks off both boxes. Never mind the lack of coordinated, neat and precise packing. Forget how two years ago, we abandoned tents altogether, opting instead for the sweetest campground rig to ever grace the Great Lakes: El Papi. A 1989, 34-foot, made-in-Michigan Avion trailer that Molly and her husband, Josh, bought used because they loved the Lucite door handle. Instead, we’ll focus on what matters. An annual adventure with friends who feel like family in a lakeshore playground minutes from home. 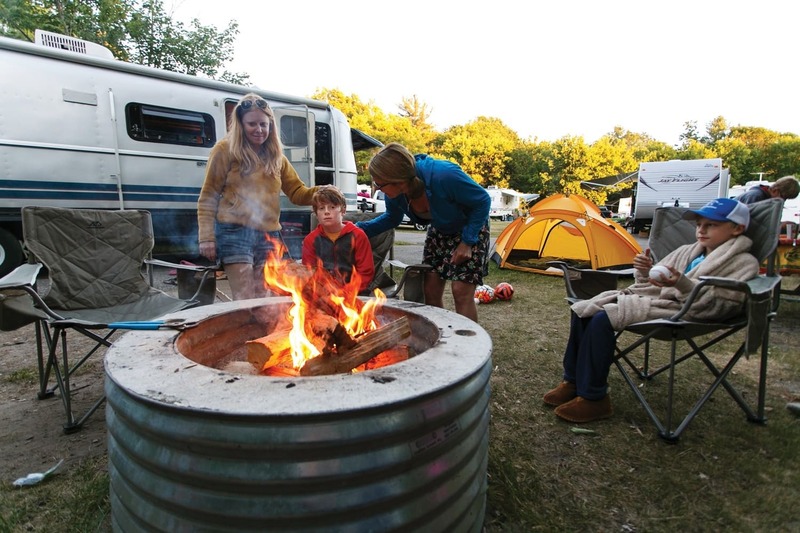 Petoskey State Park, sandwiched between Harbor Springs and the City of Petoskey along M-119, is one of the state’s most popular—and easily accessible—places to camp, and is a favorite spot for our camping excursions. 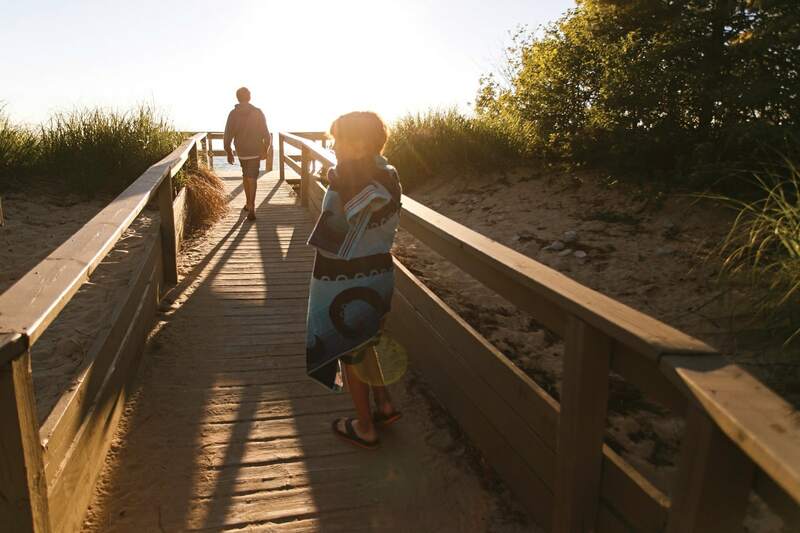 It’s got all the best of Northern Michigan: stretches of sand dunes, hardwood and conifer trails, plus a wide horseshoe beach marking the end of Little Traverse Bay, where Lake Michigan’s horizon seems infinite. The park also has all the best of nearby necessities: a paved bike path, specialty deli and market with great wine selections, even a brewery in rideable or walkable distance. By the time we arrive, Molly has already backed El Papi, a beast of a trailer (it’s always great to see the retired grandpa-types with dropped jaws in awe of her skills) into its home for the next 48 hours. The mad scramble to get-out-and-get-to-the-beach ensues. But before I can even finish dragging pillows from our car up El Papi’s steps, the kids come running back. Yelling. About blood. Max hops on one foot. He winces and points down to a steady stream of red rivering across sandy skin. We’re less than a mile from an urgent care but there’s a rush of relief as Molly takes action, her wilderness Emergency Medical Technician training mode activated. A camping trip we’ll look back on with side-splitting laughter, a comedy of errors including but not limited to: three trips to the same store, five stitches, one favorite fuzzy sweatshirt sporting a new bonfire burn hole, and a reminder of why checking email while camping never leads to good things (in this case, I learn my second book deal fell through). By 8 p.m. part of me wants to call it good and just go home. This year especially—magazine photos happening, after all—it felt like we needed to be a little more on and a little less scattered. 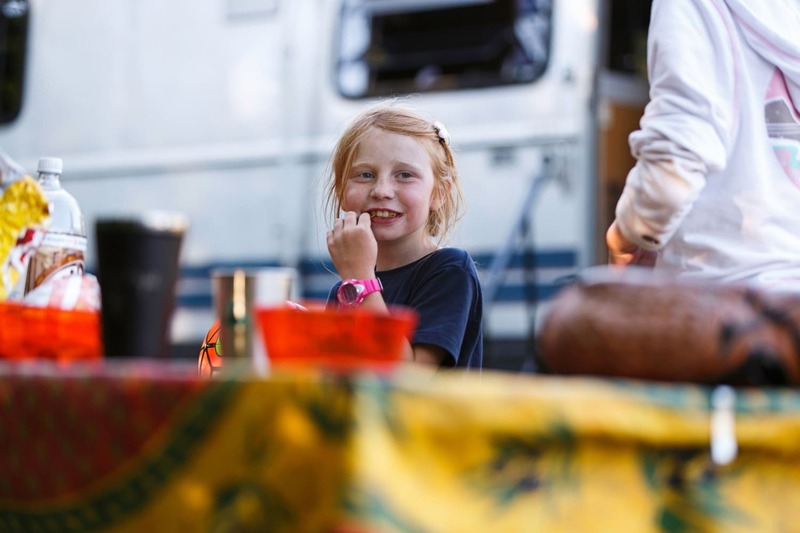 To give folks a story about the simple beauty of camping with kids. 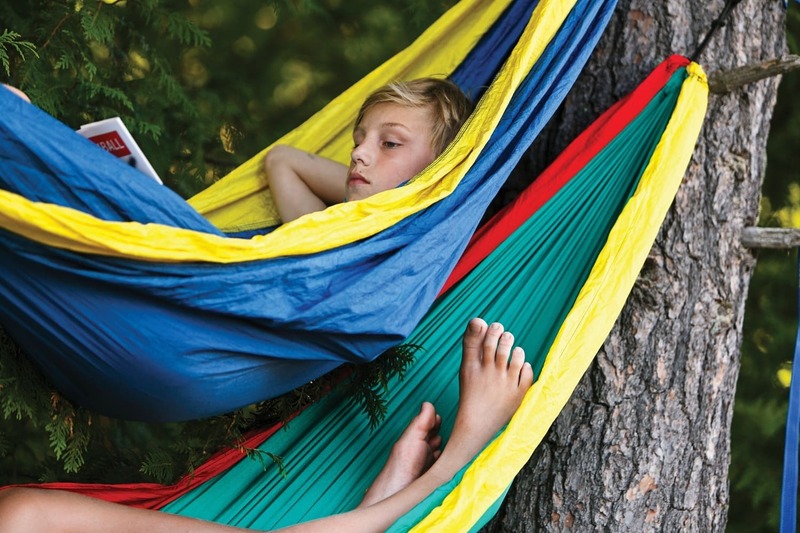 Max and her eldest, Luke, have rigged up the hammocks between two scrubby red pines. They’re nestled in and reading, content to be in the trees. Just hanging, not talking. A gift of life-long friendship. Josie and Charlie, 11 and 9 respectively, wait by the road with towels slung across their shoulders. Lizzie grabs my hand and tugs toward them, toward the beach. “Reset button?” Molly asks, handing me a copper mug and nodding toward the water. We amble down weathered wood steps to cool sand and scattered rocks. The kids don’t hesitate. They run headlong to the water, towels tossed aside and shadows stretching to catch up. One step, two steps, three. Then gone, ducking under and bobbing five or 10 or 15 feet farther into the lake. It’s strange and wonderful, being able to watch their silhouettes from shore. Traditions mark the passage of time. I remember our first camping trips near this beach. We were such earnest moms. Camping could be—should be(! )—educational and fun, we thought. Lessons tucked inside pre-planned games. Skill-building opportunities in every free moment. Kids complaining they just wanted to go mess around in the woods. 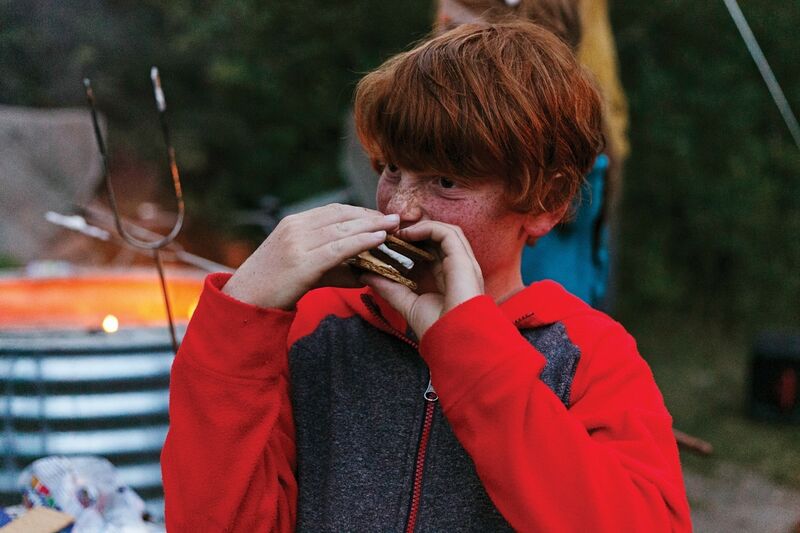 Truth is, those first campouts with kids were more lessons for us moms. We found gratitude in the luxury of time and space to sit around a fire pit and talk late into the night … And glory in Starbucks lattes and Johan’s donut delivery (via husbands) in the early morning hours. We were reminded of the importance of unstructured play. Each year, we get more relaxed. We let the kids guide us, their ages and stages shift away from some favorite activities but preserve others. Still, annual events aren’t always perfect, and by some standards, today could even be considered an epic fail. Except I’m sitting on a beach alongside one of my dearest friends. We’re watching our kids body surf to shore. Late evening sun sways on the lake like a line connecting past, present, even future. Sensory postcards of campouts past are flipping through my mind. I can see a favorite stick Charlie rescued from the fire pit one year. I can hear staccato laughter from Max, Josie’s shriek, Luke’s whisper when they chased each other across the dunes in a game of late night headlamp tag. I can smell the good bottle of cabernet we uncorked last summer after tucking the kids into the camper for the first time. 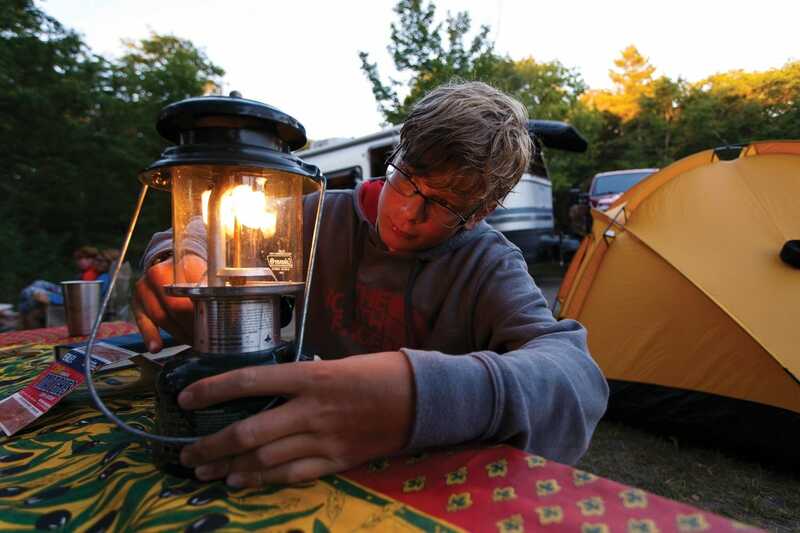 Every important camping lesson we could ever teach or learn happened by ditching expectations. Lizzie ambles out of the water, her pale skin awash in goosebumps. She wraps herself up in a towel and bends down to pick up a stone. “I think I found a Petoskey!” She goes to the outdoor educator of the group, hand extended. Before Molly can answer though, Charlie peers over her shoulder. “It’s a honeycomb coral,” he says, explaining the difference between the two Devonian-era stones. Molly adds it’s also called Favosite and grew in the area some 350 million years ago. Lizzie nods, hands me the stone for my pocket. 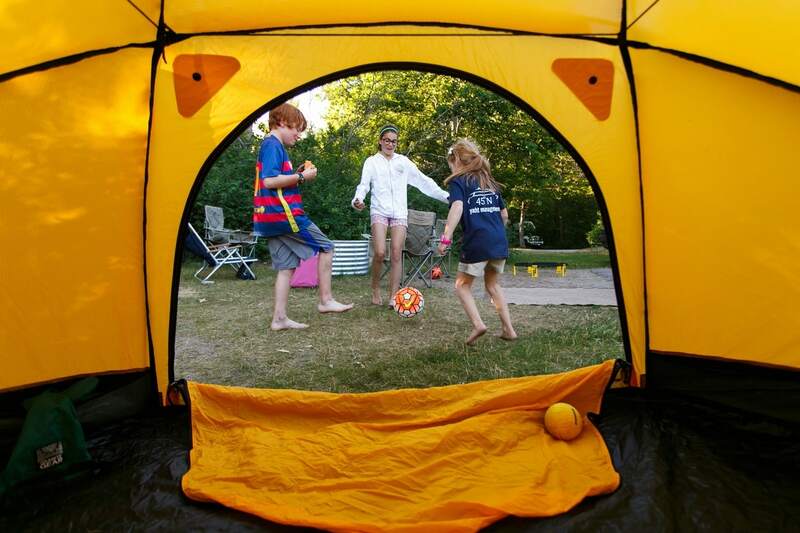 Josie, Charlie and Lizzie start back to the campsite, tossing a Frisbee, planning a game of soccer, the open door of the unused tent as the goal. Dinner comes later, with its slightly burned hot dogs and many unhealthy food choices (maybe the entire chip aisle of the grocery store). We even bust out two liters of root beer and Sprite before the kids build a fire and start making s’mores. Laughter swells. Lanterns are lit, Spot It and dice games and Go Fish get played. Camping nights are marked by filthy feet, sticky hands, brush-scratched skin. By bonfire-smoke hair and big yawns. One by one, the kids find their beds, books, blankets. They drift off as fast as they played all evening. Molly and I open a bottle of wine, fittingly called Hoopla. We step back outside of El Papi to chairs by the fire. We listen to the sounds of the campground hushing, the lake in the distance. “Today was sort of a cluster.” I half laugh, half cry. “It was,” Molly agrees, all laughter. “Turns out, we’re not Pinterest moms.” We sip wine and watch the fire. Sparks slip up toward a switchboard of stars. We’re not Pinterest moms. But we are moms who love Lake Michigan and tradition and the whispers and giggles of kids up past bedtime. Every year we pause for a day or two to enjoy why campgrounds like this are some of the state’s busiest. We slow down and pay attention to rolling dunes and cedar-stand forts. Story-filled night skies. Our Great Lake. It’s hectic to slip away from day jobs and obligations and summer sports schedules. There’s a little annoyance about the effort it takes to pack up and drive even a handful of miles—let alone a few hours—just to sleep a little closer to the wild heart of this place. The payoff, however, is better than any magazine spread can describe. It’s all the best parts of childhood combined: mischief, curiosity, wonder, presence, friendship, and a little bit of sugar. That’s about as simple and beautiful as it gets. 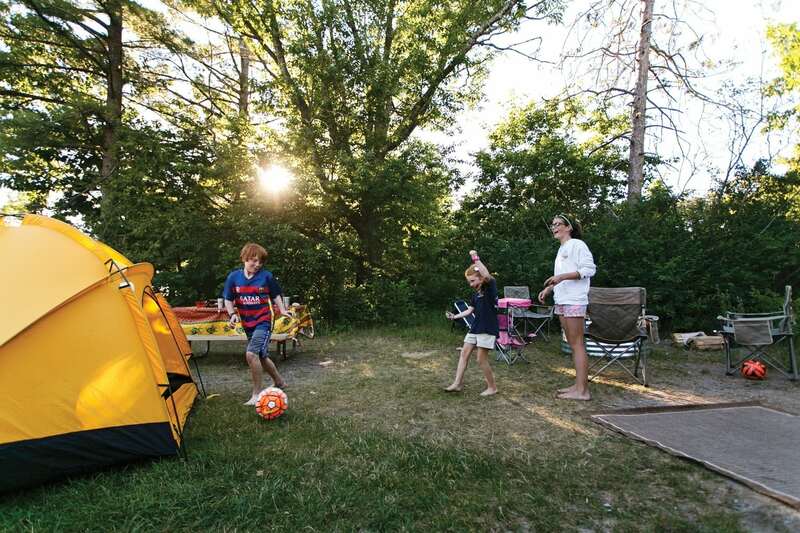 Northern Michigan’s campground selections are second to none, and many are close enough to make overnight getaways within reach. Here are a few of the Bassett and Baker family favorites. Petoskey State Park: Easy access, close to towns, killer sunsets. 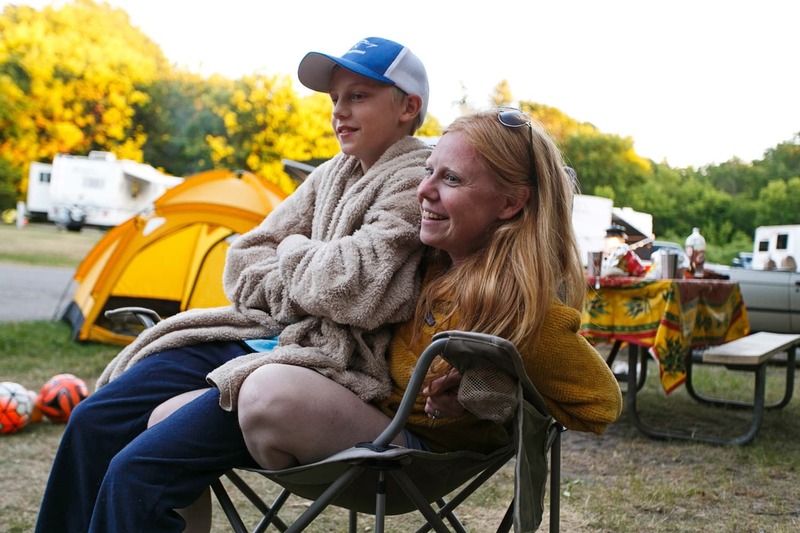 Located along M-119 (day trip up the historic highway’s Tunnel of Trees for an additional adventure), the campground books up in the busiest weeks, so plan ahead for the sweetest spots. 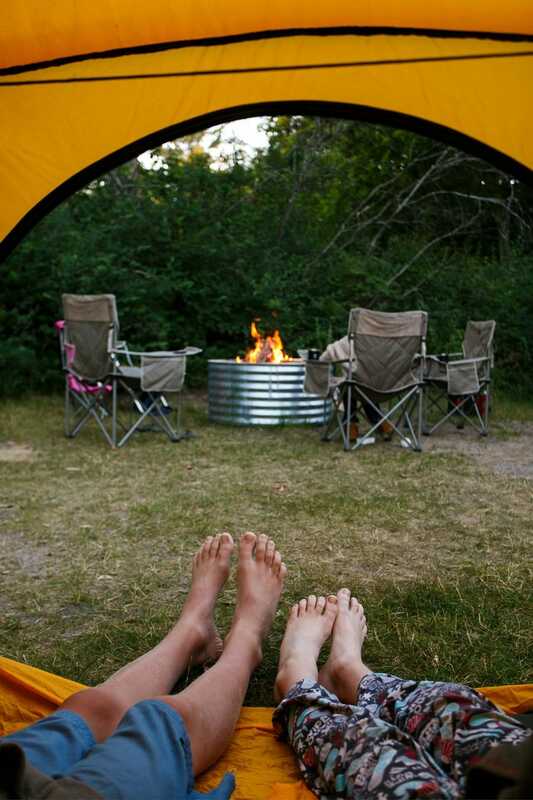 We recommend campsites 164 or 135, though every site is only a quick walk from the beach. 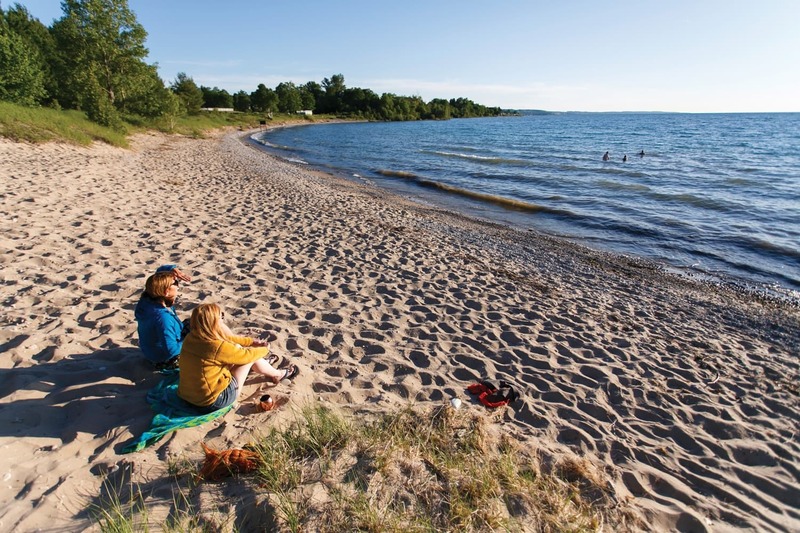 Bonus: two mini cabins can be reserved at Petoskey State Park. Wilderness State Park: Remote but popular, good variety of campsites and a handful of rustic bunkhouses, mountain bike trails, piping plovers, and a grand total of more than 10,000 acres of wilderness. Located 11 miles west of Mackinaw City. Killer lake views from campsites 76 through 111 (though it’s a stretch to get to the bathroom). 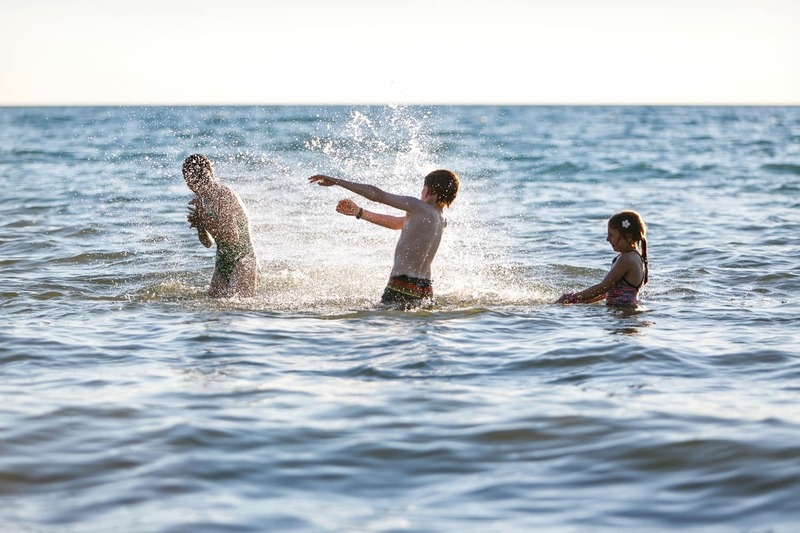 Young State Park: A favorite for families and loved for its cedar swamp, rolling-hill hiking and designated swim spot on the east end of Lake Charlevoix. Campsites are tucked in the back of the park, lending a remote vibe. Money spot is number 25 in the Oaks (steps from the water) but it books fast. Two mini cabins also avail- able. Day-trip or get dinner in Boyne City, where great restaurants, taprooms, and events like Stroll the Streets happen on Friday nights downtown. You can reserve spots at any of these campgrounds online. Kate Bassett is news director at the Harbor Light newspaper. Her first novel, Words and Their Meanings, is available in bookstores and on the web. kate@ncpublish.com | Melisa McKolay is an award winning photographer specializing in lifestyle portraiture & wedding photojournalism. mckolayphoto.com.